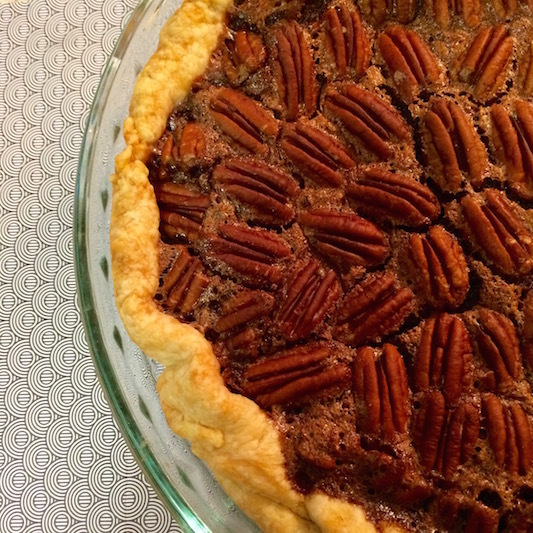 I'm sharing two recipes back-to-back because, Thanksgiving. If you need a dessert for tomorrow that's a cinch to throw together, this is your pie. Pecan pie has to be one of the easiest pies to make, so please take an extra 5 minutes and make your own pie crust, too. This chocolate pecan pie has a fudgy chocolate bottom with all of the pecans resting on top. It's a nice twist on a classic without straying too far from the pecan pie everyone is expecting for Thanksgiving dessert. Preheat oven to 350 degrees, with rack in lowest position. In a heatproof bowl set over (not in) saucepan of simmering water, melt chocolate, stirring occasionally, until smooth, 2-3 minutes (r melt chocolate in microwave). Set aside. Bake just until set (filling should jiggle slightly when pie plate is tapped), 50-60 minutes, rotating halfway through. Let cool completely on a wire rack, at least 4 hours (or up to overnight) before serving.